In the early 1800s, Dakshineswar was a small village along the eastern banks of the River Ganga. The picturesque details by J С Marshman in the January 1845 issue of Calcutta Review mentions a little higher up we have the village of Dukhinsore, remarkable chiefly for the country seat, mapped down in the map of Hastie's Garden, but which has repeatedly changed hands during the last thirty years. To the north of it lies the Powder Magazine. During the last four years which have elapsed since Joseph's map was published, four elegant houses have sprung up to the south of the garden. Swami Saradananda mentioned in the Lilaprasanga, 'It is recorded in the Endowment document that the land of the Kali temple complex is 60 bighas.' In the paper itself, we come across the fact that the plot calculated to 54 1/2 bighas, with the surroundings of the Ganges in west, the land of Kashinath Roy Choudhury in east and the constructions of John Hastie in south. Later a part of the plot was used for a railway line and for the Vivekananda Bridge. So the current sum of the land mass is around 58 bighas. The idols of the Gods and the Goddess was decided to be installed on the snana-yatra day, an auspicious days of the Hindus. 31st May 1855, more than 1 lakh Brahmins were invited from different parts of the country to grace the auspicious occasion amidst the controversy of the Rani being in no position to own a temple and to offer Brahmins to feed since she was of low birth. Rani Rashmoni being aware of the problem discussed in length with the pundits, but none could solve her problem. Only Ramkumar Chattopadhayay, Sri Ramakrishna's elder brother suggested that dedicating the temple to a Brahmin could overcome the existing problem The temple was dedicated in the name of Rani's Guru, and Ramkumar, was the head priest, who installed the idol of Kali in the new temple with a grand splendor on Thursday, 31st May, 1855. Many Intellectuals of shastras (scriptures), Brahmin pundits, and celebrated scholars arrived from distant places like Kashi, Orissa, and Nabadwip. 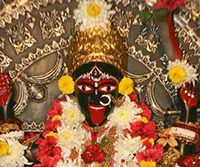 Within a year he passed away leaving the entire responsibility to his younger brother, Ramakrishna, who during the subsequent thirty years became the seeker of the Goddess Kali and an ardent devotee who imbedded the seed of change in the socio-religious condition of Bengal and earned immense reputation for the Dakshineswar temple. The exceptionally open-minded Rani wished that pilgrims of all casts and religions could offer prayers at the temple. 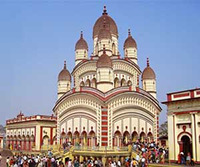 Her dreams were fulfilled since irrespective of religion and castes Dakshineswar is thronged by millions of devotees and admired for its peaceful ambiance. The Rani lived only for five years and nine months after the inauguration of the temple. She seriously fell ill in 1861. Realizing that death was approaching she decided to handover the property she purchased in Dinajput (now in Bangladesh) as a legacy for the maintenance of the temple to the temple trust. 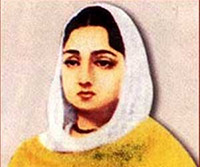 She accomplished her task on 18th February, 1861 and passed away on the subsequent day.